When this bloody war is over…. How I’ll miss him, how he’ll grieve. When I have published this photograph previously I have concentrated on the faces, there is such a wide variation of emotion. This time I have reproduced the entire postcard because there is some interesting detail, including the the old-fashioned guy ropes and the nosey private poking his head out from one of the tents. Judging by the shoelaces on the front row it was a rush job, so maybe some of those expressions are prompted by irritation. 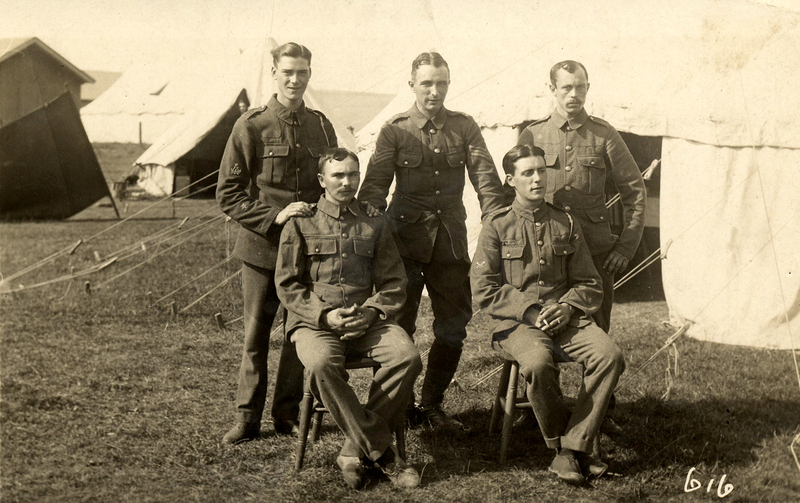 I am guessing this is my maternal grandfather, Fred (seated on the right with a cigarette in hand), when he was still in the Territorial Army, before his dispatch to Gallipoli in January 1915. I have no record of how long he was posted there but by late 1915 he was at the RFC Training School, Aboukir in Egypt where he would stay until January 1919, rising to the rank of Chief Mechanic. On dispersal he is granted 28 days leave in arrears at the rate of five shillings per day, a ration allowance and money for a set of ‘plain clothes’ – is this the suit he is proudly wearing in this post? He walked out of Fovant with £2 in his pocket and two postal drafts – his identity paper shows that these were cashed at his home town of Andover on the 1st and 11th March 1919 respectively – his Savings Bank Book was issued on 26th March 1919. 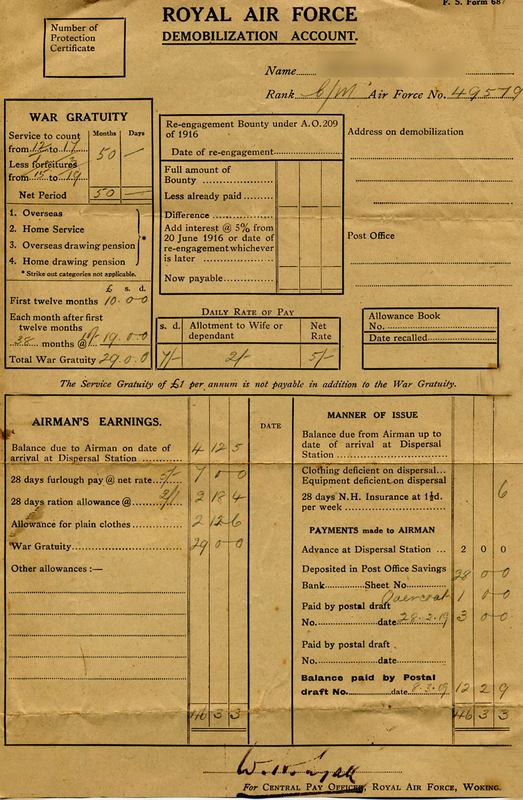 In the midst of the small print and the cumbersome administration is perhaps the most telling of all mean-spirited statements: The Service Gratuity of £1 per annum is not payable in addition to the War Gratuity. They had evidently not done enough to deserve it. 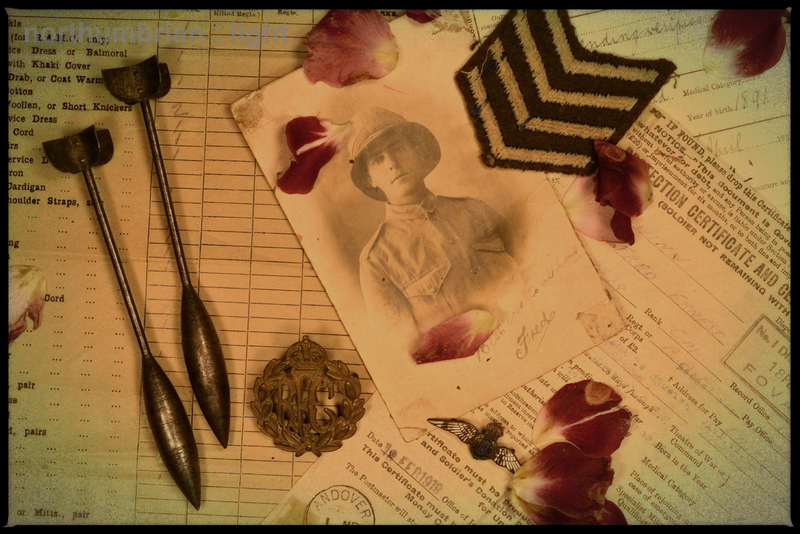 Earlier posts show my maternal grandfather serving with the Royal Flying Corps in Egypt during the Great War. 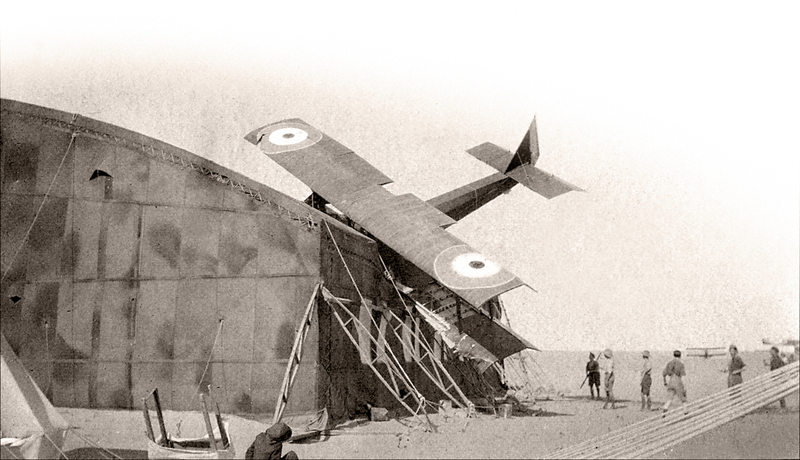 Fred was dispersed from Fovant Camp near Salisbury on 18th February 1919. His brother William, also in the Royal Flying Corps but based in the UK was already gone, dying in the last gasps of conflict from Spanish flu. “La Grippe Espagnole” killed more people than were lost during the entire Great War. It has been cited as the most devastating epidemic in world history, killing more people in a single year than during the four years of the Black Death. The King commands me to assure you of the true sympathy at His Majesty and the Queen in your sorrow. He whose loss you mourn died in the noblest of causes. His Country will be ever grateful to him for the sacrifice he has made for Freedom and Justice. An unthinking example of disconnected bureaucracy, it fails to acknowledge who He is, whilst succumbing to flu is somehow deemed a noble cause rather than the tragic chance act of nature it really was. The standard letter is ‘signed’ (printed) Winston S Churchill, Secretary of State for the Royal Air Force (the RFC became the RAF on 1st April 1918). ‘Billy’ died on 5th November 1918 aged 25 and was buried six days later on a day heavy with symbolism, November 11th, Armistice Day. 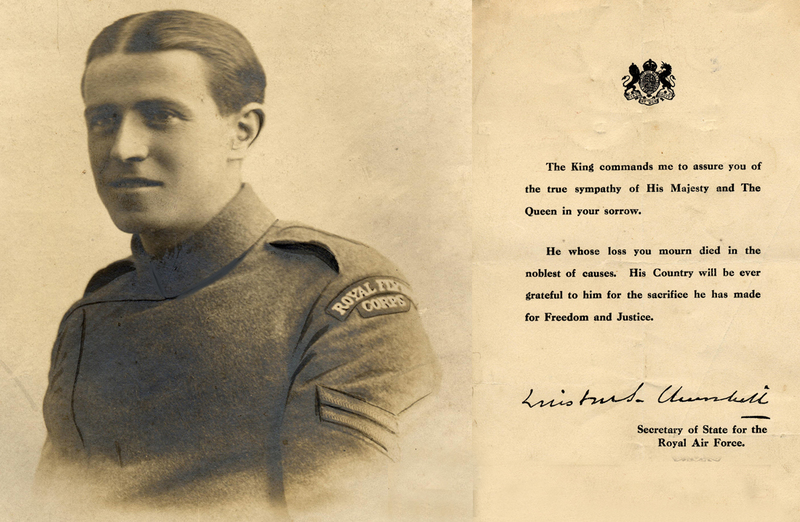 His funeral was marked with military honours at Andover Cemetery in the presence of his mother, father, ‘chums and superior officers’ and his fiancée, Miss Coombes. Miss Coombes and Billy, the great aunt and uncle I never had. Fred was still half a world away in Egypt and given the communications of the day, almost certainly unaware of his loss.